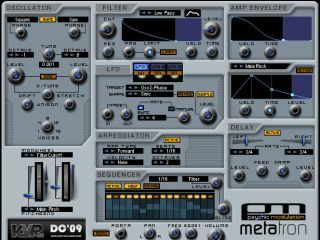 Psychic Modulation's Metatron is just one of the plug-ins in contention. Now in its third year (though it didn't actually happen in 2008), KVR's Developer Challenge gives music software coders the chance to compete to create the finest new free plug-in or app. Better still, it gives users the chance to download these and then vote for their favourite. Submissions for the 2009 KVR Developer Challenge have now closed, and a total of 42 free treats are awaiting your attention. Discussing the motivation for the contest, KVR says: "The challenge is to create and release a brand new free audio plug-in or audio application that will benefit the community at large. "Creativity is key, it can be as simple or as complex as you want - KVR members will vote on the entries and pick the eventual winner. Anyone can make a donation via PayPal, the prize fund will be distributed to the eventual winners (details below)." As we write, that prize fund stands at £832. Make sure you put some money in the pot if the entries impress you.